As a child, Laura Linney attended boarding school, and spent three summers at Camp Equinita, a private summer camp for children. Her parents divorced while Linney was an infant, and she was mostly raised by her mother. But the time she spent with her father (a professor, playwright, and two-time Obie winner) had a profound impact, and young Linney soon decided she would be an actress. When she was 12, her father got her a job as a stagehand at a New Hampshire repertory theatre. She later studied drama at Northwestern, Brown, and the Juilliard School, where she became good friends with another student, Jeanne Tripplehorn. On stage at Juilliard, Linney once had a massive anxiety attack or "near nervous breakdown." "There I was on stage," she says, "and suddenly I came out in these sweats. I couldn't concentrate. ... I wasn't sleeping either, which made me even loonier. But it wasn't depression, it was fear, a very odd thing. I was just terrified that something was going to split open." After Juilliard, Linney's career progressed slowly. She filmed several commercials, appeared in a few plays, and eventually understudied in the original Broadway production of Six Degrees of Separation. Her first film role was a small part as a teacher in Lorenzo's Oil, with Nick Nolte and Susan Sarandon. 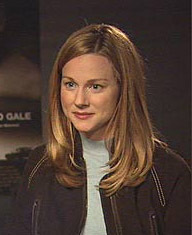 In the 1993 PBS miniseries Tales of the City, Linney played the nominal lead, Mary Ann Singleton, a sweet girl from Nowheresville who moved to wild 1970s San Francisco. The series was a huge hit for public television, but when some viewers complaints about its positive portrayal of assorted "immoral" lifestyles, PBS decided against filming a sequel. Three sequels have aired on Showtime instead, with Linney reprising her role. She has also become good friends with Armistead Maupin, the author behind the series. In films, Linney's breakthrough role came in The Truman Show in 1998, where she played Jim Carrey's duplicitous wife. She was nominated for an Oscar for You Can Count on Me in 2000, playing a woman reunited with her estranged brother (Mark Ruffalo). To help that low-budget film get made, she took only the union minimum for her work, about $10,000.